As part of Chaya‘s new guest chef series, Marcel Vigneron presented a multi-course meal with Chef Haru at Chaya Brasserie last night in Beverly Hills. Unfortunately, I had dinner plans I couldn’t break so I didn’t get to taste the incredible sounding food. 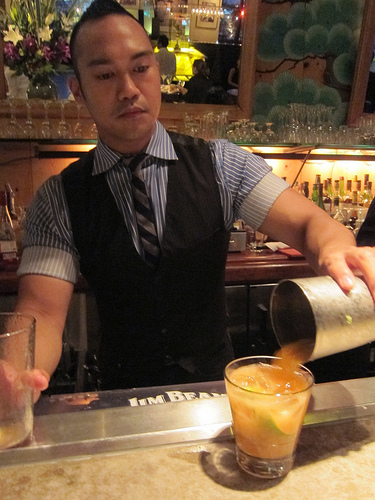 I was bummed but was cheered when I heard Devon Espinosa, Marcel’s bartender on Marcel’s Quantum Kitchen was making drinks at Chaya. Booze? That I can do. Devon and I go way back and he has such an infectious smile, it’s hard to be in a bad mood around him. He’s always cheerful and has a vast knowledge of cocktails. Give this man his own show already! 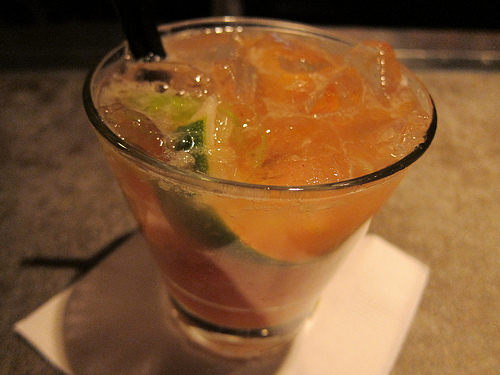 For my first cocktail, I decided on the breezy Peach Caipirinha. I was a bit puzzled by this list as there were no whiskey cocktails but I reminded myself it is summer and perhaps I should order a cocktail for the season. Made with infused carmelized peach Sagatiba cachaca, agave, fresh lime and peach, this was a delicious cocktail and went down quickly. 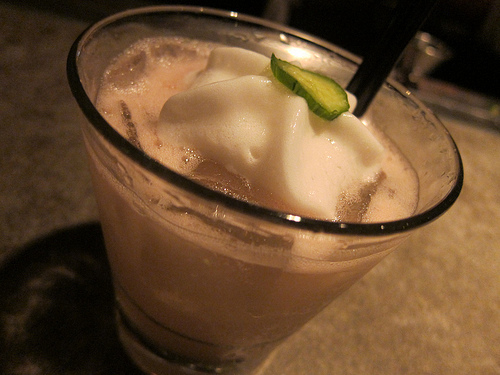 The Summer Crush with Plymouth gin, lime, watermelon, cucumber and almond jello espuma was fantastic. Devon made sure I sipped directly from the espuma. Although sweet, it was very balanced. I had a “palate cleanser” and Devon plopped a liquid nitrogen sangria in front of me. It was super icy and I’d call it a vast improvement over anything 7-11 could serve up. Adult slushie! 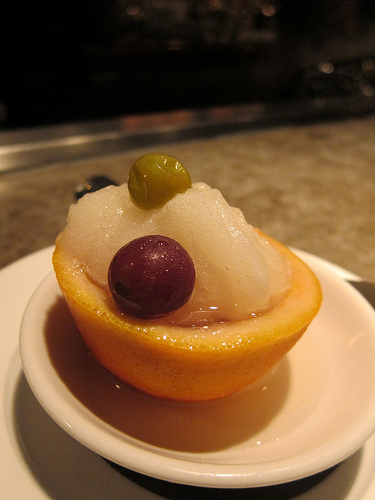 Want to see the cool vid of Robert of Marcel’s team making the liquid nitrogen sangria? Here ya go! 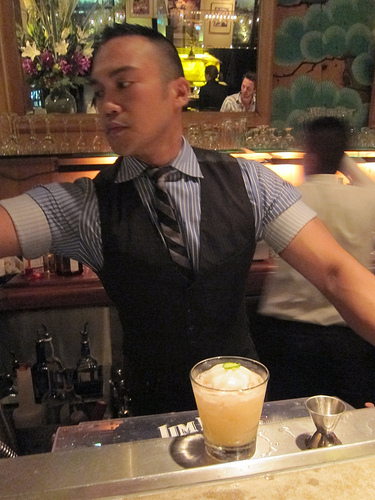 The Thai Reviver is Devon’s version of a Corpse Reviver. 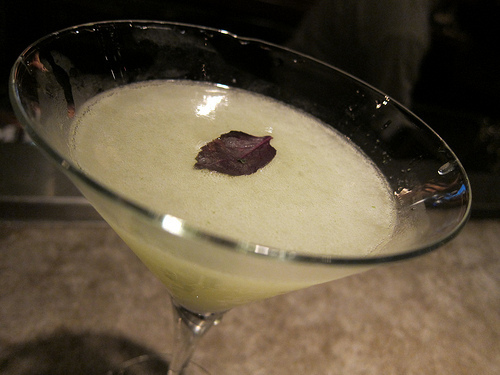 With Plymouth gin, Cointreau, Lillet Blonde, lemon and Thai basil, it was a very pretty drink. If you love tart drinks, this is the one for you. 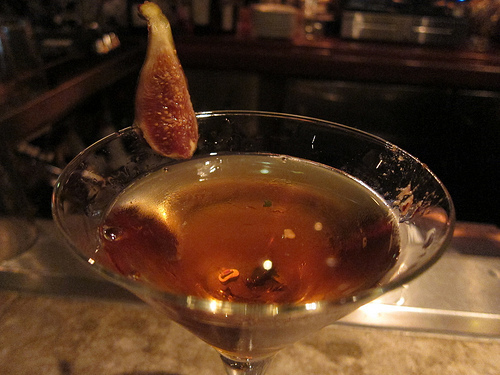 The Aficionado (Esponlon reposado tequila, Amontillado sherry, Carpano Antica vermouth, figs) was the type of cocktail I was looking for when I sat down. This was definitely a fine sippin’ cocktail that I know Devon must have devised for the cocktailians in the house. I had a really great time and loved that Chaya even had a photo booth where guests could take lots of pics. I just need to figure out more than one pose! I ran into a chef who recently departed from his restaurant. He said he may guest chef soon at Chaya. I’ll be waiting for his pop-up!